Now here is something you don’t see everywhere … the Northern Lites. There’s not much that’s prettier than the Northern Lites! 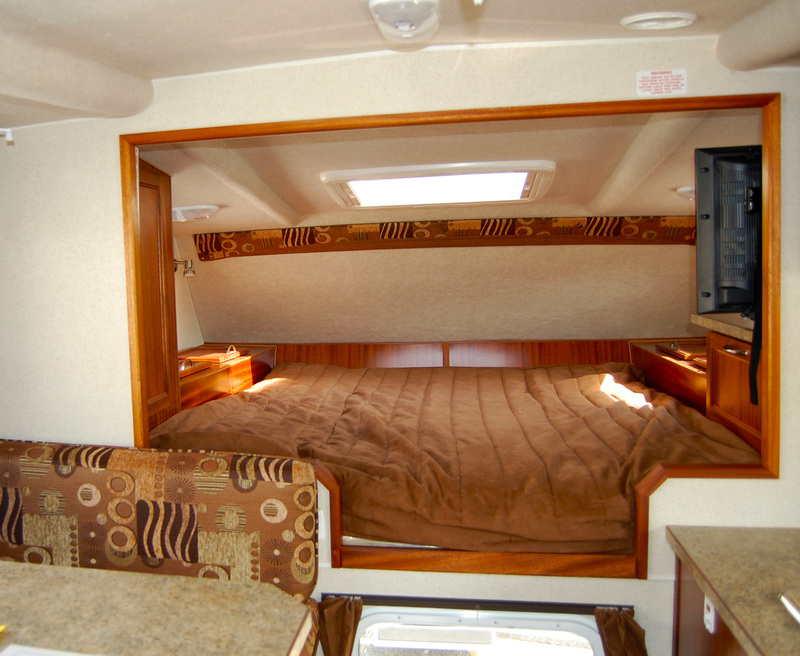 For those not in the know, Northern Lite campers are made of fiberglass, like a clamshell – with a top and a bottom. Then these two shells, that are very strong yet very light, are fastened together – and are watertight like a fiberglass boat. There’s a 2″ overlap so that there’s no chance of water leaks, and they just seem to last forever (I can attest to that, owning a similar 1985 model that is trouble-free)! They’re the only manufacturer that I know that has a 6 (yes, six) year structural warranty. 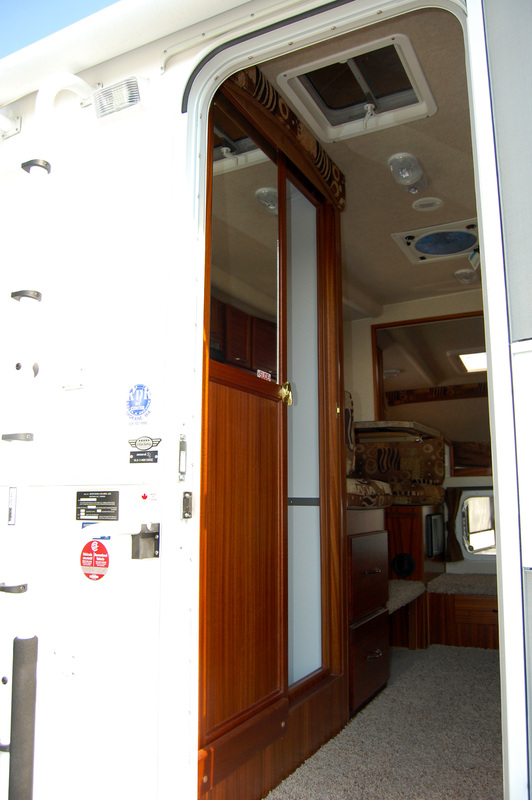 Right away the African Sapele wood used in the interior grabs my attention. This is the wood trim used on Cadillacs … and it has the look of Mahogany. 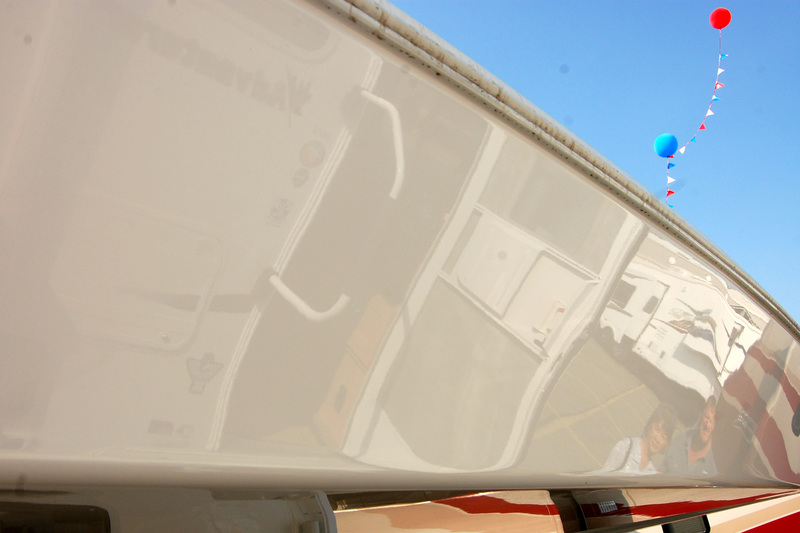 Ooooo … every piece is nicely matched … a work of art it is! 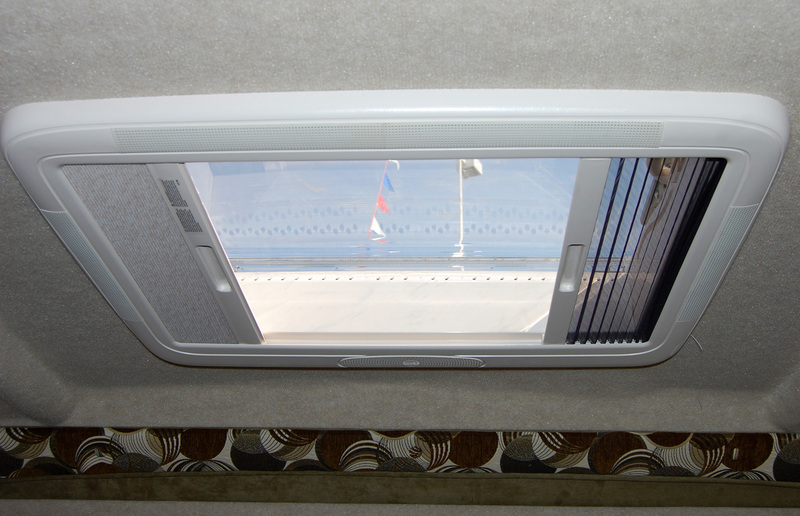 On all windows, and on the skylight above the bed, you can open them (of course) … or pull a sunshade screen from one side … or a total shade from the other side. Pull either all the way, or just part way. 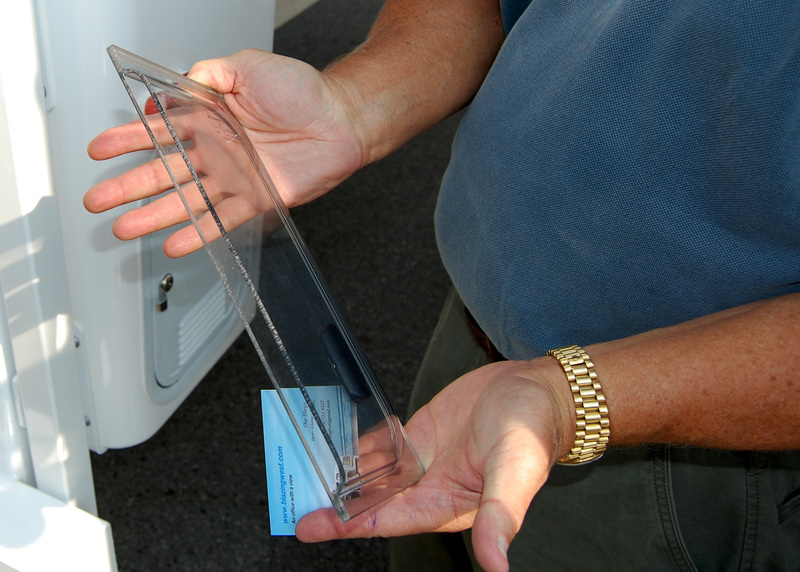 … or pull the shade up from the bottom (for privacy, or to ensure no water comes in on a rainy day) … or pull the screen down from the top (part way, or all the way). Very practical. Nicely executed. Well thought out. 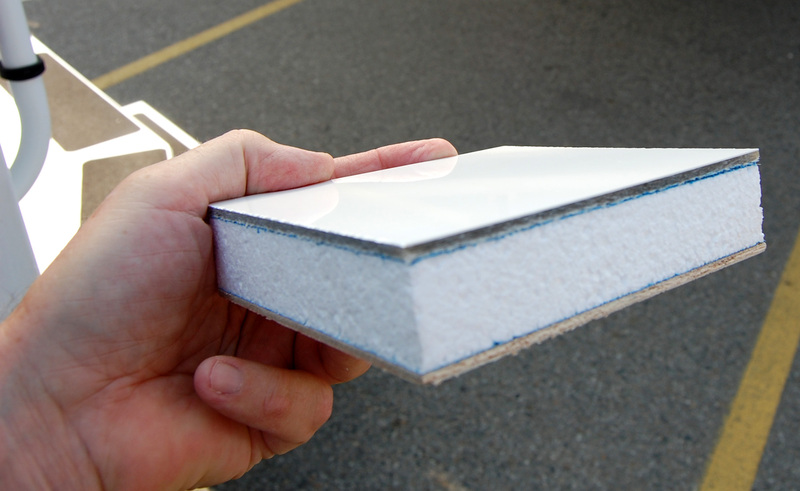 Thick insulation – hey, this is manufactured in Canada, what would you expect? Double insulation under the bedding area – for the perfect temp while sleeping. Nice. They use closed cell insulation too (unlike many manufacturers who use the less expensive open cell). The drawers are made of Russian Birch … there is NO particle board or chipboard in the Northern Lites! Get a U-shaped dinette, or the “Dream Dinette” … that great table that has no annoying legs, and that pushes down to the bed position with the flip of a lever. Also, the distance from the dinette seats is adjustable for those who may have sat a little too long at the feed trough. And here’s the 8’11” mounted on a short bed. Very well matched – size, weight, and an amazing layout too. I could hardly tell the difference between the two models shown – perfectly laid out. 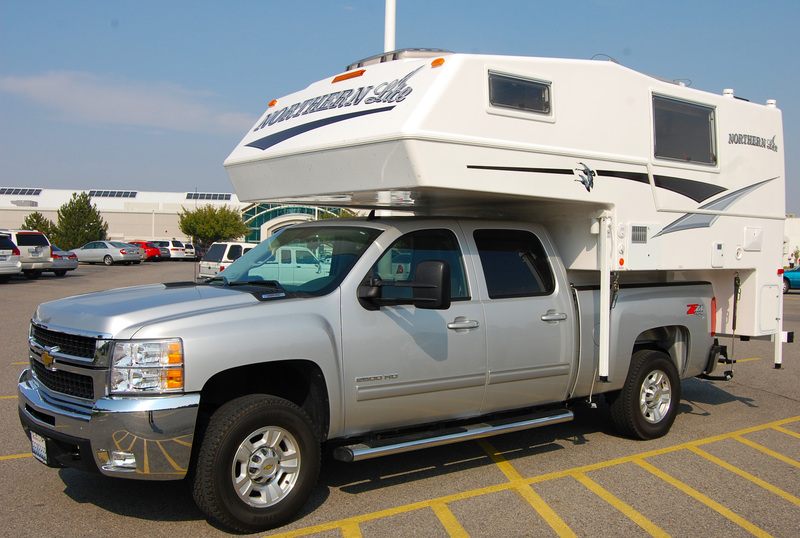 This is a great camper with a stunning reputation (the only camper with a 5-star rating in the RV rating book for 10 years). 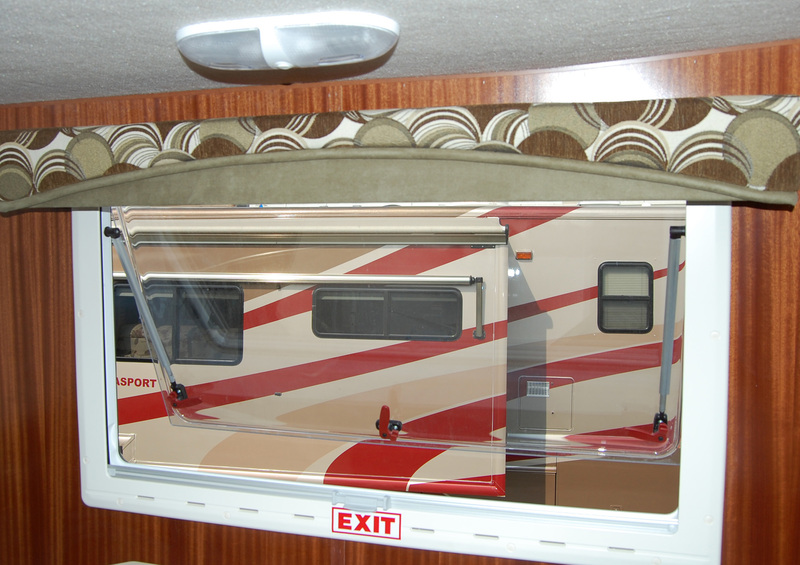 The SE model had dual battery trays, dual propane tanks (all on sliding trays, of course), Fantastic fans, awnings – you name it, it’s available. All the tanks are heated … in two different ways. No winter mistakes here. For all of the Northern Lites, check here for pics and deeper information. Knute, the manufacturers rep, tells of the times he was in charge of a dealership in Mt. Vernon (that’s Knutes rig pictured above). 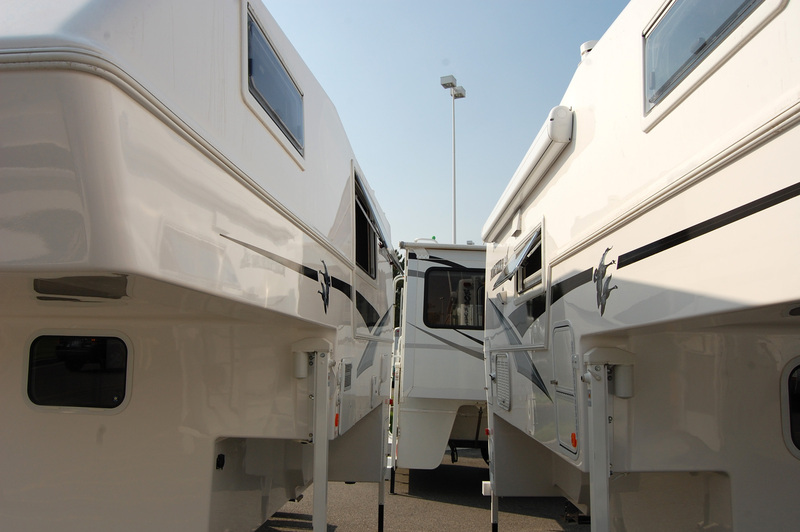 When dealers get campers, trailers, and motorhomes from the manufacturer, repairs, fixes, and assembly was often required. NOT so with Northern Lites … they came ready to go and in full working order. The first time … and every time. This is the kind of TC that you just want!